During group time, while the rest of the children are watching me and listening to what I'm saying, Adam is looking around seeing what his classmates are doing. At the same time Hanna is gazing at the pictures on the walls. "Adam! Hanna! Eyes on me!" I reminded them for the third time. 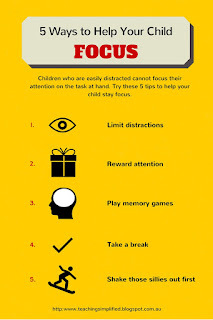 Children like Adam and Hanna have difficulties focusing their attention. As a result they miss out on the lessons and are usually the ones falling behind on their learning. This is the one thing that I 've noticed from children who are not learning - they are usually the ones who are not focused. They are easily distracted so they don't fully understand what is going on in the lesson. They neither can follow a story being read to them nor can they comprehend what they're reading. 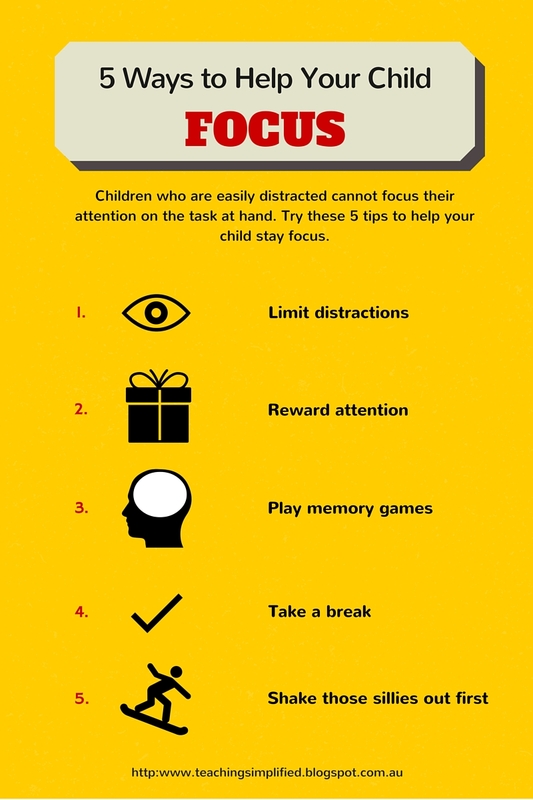 Here are five ways that can help children to focus their attention. 1. Limit distractions. This might seem obvious but distraction comes in many forms. It could be the whirl of the ceiling fan, a person walking past the door, a noise outside the window, the colour on a poster or a fly buzzing around. Some distractions you can control but there are others that you can't. So do your best to minimise distractions as much as possible. Look around your classroom or your child's study area and ask yourself what things are likely to be distractions and then remove them. 2. Reward attention. Every time your child pays attention, offer positive feedback ("Adam, you're attention is on me. Great!" After you've given positive feedback or descriptive praise, give the immediate benefit (When you pay attention, you learn"). 3. Play memory games. To train your child to focus his attention, what better way then to play memory games? He'll have fun while learning to channel his attention on one thing. Some memory games are concentration such as finding the matching pictures, letters or numbers, listening to a clapping pattern to repeat it, and recalling the items on a tray. 4. Take a break. Some children can't sit still for long. This is especially true for young children but also for older children as well. One 10 year old that I tutor always need a break to stretch his legs after 30 minutes. After a 5 minutes break, he can get back to work. If you find that your child is like this then offer him a short break but make sure he doesn't get involved in anything during the break or his mind will still be on it when he gets back to work. For younger children, if they've been sitting for ten minutes then get them up and moving to some action such as pretending to be hopping bunnies or do a rocket ship countdown. 5. Shake those sillies out first. There's a song that goes "We're gonna shake, shake, shake our sillies out...clap my crazies out...jump our jiggles out..." - you get the picture. Give children a chance to shake it up first before they have to sit down quietly and concentrate. Sometimes this is all they need to then focus their attention. 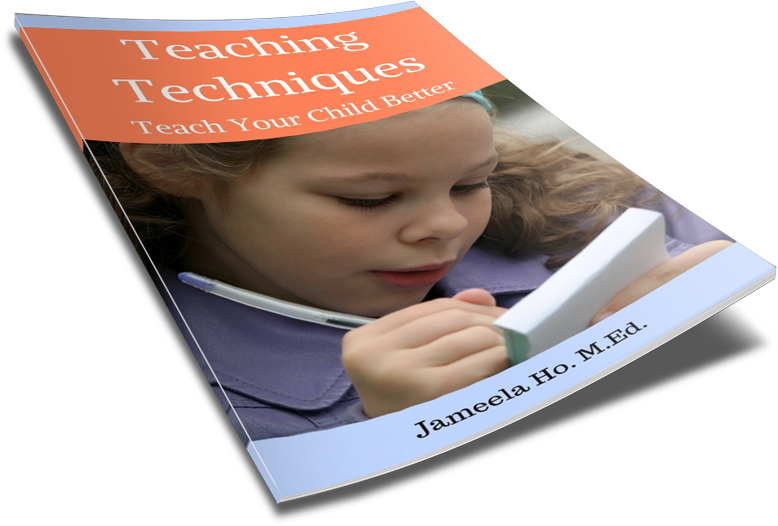 Is there anything that works for your child? I'd love to read in the comments below.